Bullseye is an area around the target that has a 3-meter radius.  It is used to derive two new Metrix statistics: Bullseye Hit and Inside the Bullseye Putt. A successful tally for Bullseye Hits is recorded by reaching the bullseye on first shot on any par three hole. On a par four landing within the 3-meter bullseye on the first or the second shot yields a Bullseye Hit. A Bullseye Hit is also a Green Hit. Bullseye Hits are recorded as a golden circle on live scoring. If a hole is completed with a throw originating from the bullseye it will be recorded as an Inside the Bullseye Putt (IBP). Bullseye putts are not included in the Inside the Circle Putts. Inside the Bullseye Putts are often referred as tap-ins also. The bullseye is added to improve the Disc Golf Metrix. The addition of the Bullseye affects the Metrix statistics in number of ways. Bullseye hits showcase spectacular drives on par 3 holes and equally amazing feats on par 4 and 5 holes. Recording a bullseye hit on any hole shows that a player’s long game is on point. Inside the Bullseye Putts is where the bullseye really kicks in though – it excludes tap-ins from Inside the Circle Putts. It also shows if a player is saving pars with outstanding approach shots as often a drive might miss the green and a player is left with a long upshot.